If you are interested in buying an APQS longarm quilting machine, we are a dealer. Sharan has owned a Millennium for a number of years and is proud to be a representative. She can answer most of your questions, and if she can't, she can find out who can! 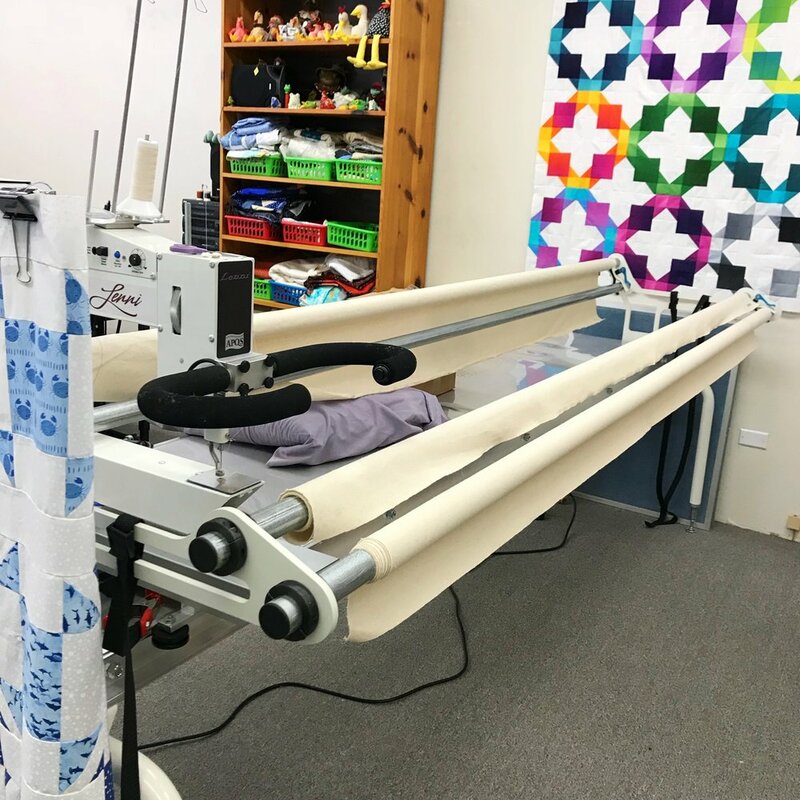 We offer customers the opportunity to rent an APQS Lenni Longarm machine to quilt their own quilts. This is a good opportunity to decide whether longarm quilting is for you. In preparation to rent the Lenni, each quilter needs instruction on how to properly, safely, and successfully use the machine. The instruction class costs $15 an hour, and usually takes 2-3 hours to complete. During the class you will be provided with instruction, demonstration, and the time to try each area of operation. After you have completed the course, you are prepared to rent the machine at an hourly rate. It is important that you begin the hourly rental soon after your instruction. If you don't use what you learn within a short time, you "Use it or lose it!" If the machine is not used within six months of the instruction class, the quilter will need to have a refresher class. Only one person per class. If you are experienced (with the store owner's final decision) the class can be two people with adjusted fee(s). Experienced: We will go over threading the machine, bobbin winding, loading, etc. if needed. For $26 we can optionally provide thread and pre-wound bobbins, and a practice quilt sandwich (top, batting, and backing) loaded and ready to go. If you want to furnish your own thread, the machine will need tension adjustment (on your class time) and we cannot guarantee that your thread will work. Batting and backing: 36" x 48"
Quilt top: 36" x 45"
Stop by the store or give us a call if you have any questions, or to schedule a class.